This open die forging press is a very stiff and rugged under the floor press, also known as pull down press having an extremely low center of gravity. The pull down concept also provides a clean forging area with excellent accessibility. 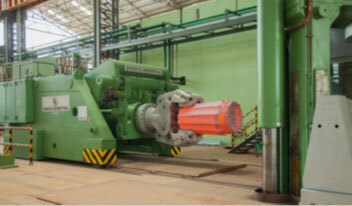 The press has extraordinary dynamics and a speed of 215mm/s and has 110 strokes per minute. A rail bound Manipulator on one side and a mobile Manipulator on the other side of the press can be remotely controlled simultaneously by the press operator from the control desk. structure to make them rigid. The high weight of the machine made the manipulator sluggish and slow. The new compact design ensures that the manipulator is strong and rigid and has fast movements without losing rigidity. Our open die forge shop is equipped with Rail bound forging manipulator of 30 MT carrying capacity and maximum tongs moment of 60 Ton-Mtr. 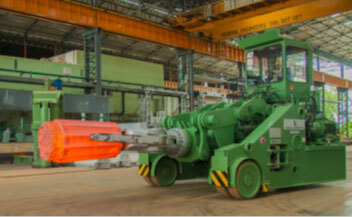 The 14 MT Mobile forging manipulator has a maximum carrying capacity of 14 MT and maximum tongs moment of 24 Ton-Mtr. In order to handle small forgings and move the hot stock in a very short span of time between the furnace and the press, this Diesel – hydraulic driven mobile forging manipulator comes very handy, especially for handling titanium, aluminum and exotic alloys. This is also from Dango & Dienenthal, Germany. CHW Forge continuously strive to install latest technology to reduce energy costs and carbon emissions. 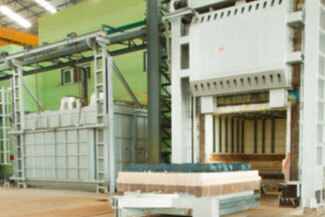 Our forge shop is equipped with modern gas fired and electric operated furnaces. 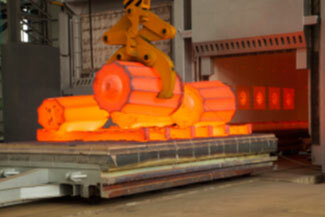 The furnaces can be operated up to 1270 degree centigrade. This furnace is equipped in lightweight design for a flexible operation and with air-preheating for an economic operation. 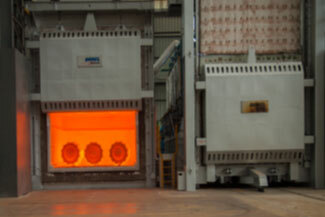 An essential advantage of this furnace, especially when using high-quality material, is that no overheating at the surfaces occurs and therefore an optimum homogenous heating can be guaranteed. AM-REGTAKT mode which ensures the maximum heating before the burner starts. 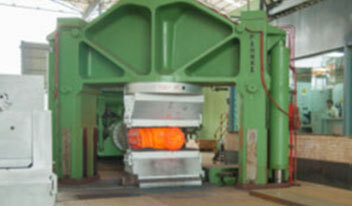 furnace is suitable for heating of exotic materials, super alloys, titanium etc. uniformity is maintained with the help of 2 centrifugal flow type re-circulation fan located at the roof of the furnace for efficient circulation of hot air inside the heating chamber.